For horses who are not receiving a balanced concentrate feed, the highly palatable Purina® Free Balance® 12:12 Vitamin & Mineral Supplement provides the added vitamins and minerals needed to balance a pasture or hay-only diet. 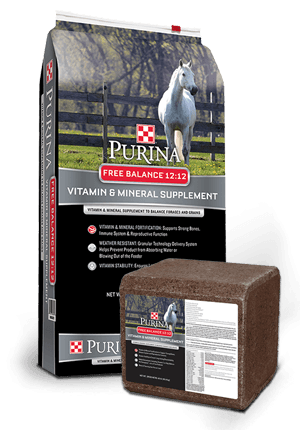 Purina® Free Balance® 12:12 is also available in a 40 pound block. Throughout history, the ability to pick up and move to “greener pastures” has permitted generations of horses to thrive on forages. Total freedom and mobility has meant they naturally received nutritional variety from the vastly different geographic areas they frequented. But today’s horses are typically limited to a single type of forage in one geographic area. Pastures in the same area or even different sections of the same pasture can have inadequate and/or inconsistent nutrient values. Grains such as oats and corn also have inadequate and/or variable amounts of protein, minerals and vitamins. So horses need help to achieve the nutritional balance they once derived naturally.